The SITES infrastructure offers research opportunities in a range of wetland environments of different types throughout Sweden. Many of these environments have been studied over a long period and offer unique opportunities in terms of infrastructure to measure fluxes of carbon dioxide between mires and the atmosphere, emission of methane, and export of carbon in run-off water. 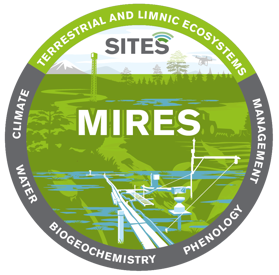 The SITES infrastructure includes one of the most intensively studied mires in the Northern Hemisphere, with the world’s longest continuous measurements of total carbon and greenhouse gas balance on a mire. Read more about what the Abisko, Asa, Grimsö, Skogaryd and Svartberget stations can offer you as researcher. Stordalen mire is located ten kilometres east of Abisko. Over the past 30 years, infrastructure has been built up to study the permafrost, which has completely disappeared from parts of the lowland palsa mire. The extent of the wetland vegetation has grown considerably, and methane emissions have increased. Soil temperature is measured, both in the mire and in the moraine. Several research teams have equipment stationed at Stordalen mire. These teams, individually and collectively, have improved understanding of functions and processes in the mire ecosystem. 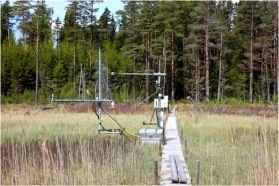 Stordalen mire is also an ecosystem station for quantifying greenhouse gas fluxes within the ICOS research infrastructure. 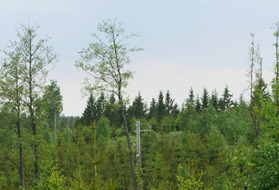 The Aneboda research area, comprising natural forest and mires in various stages of development, was hit by the Gudrun storm in 2005. The subsequent infestation by bark beetles drastically altered the character of some of the area, and much of the old spruce forest has been replaced by grass, bushes, small trees, fallen dead trees, and high stumps. The area is ideal for experimental studies of conditions, processes and dynamics, and as a reference to conventional and intensively managed forest in, for example, the Asa research area and high-yield forests. 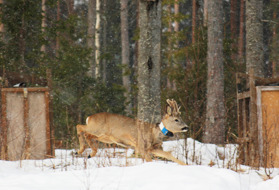 Mires in the research area and high-yield forest area are not equipped with instruments for regular measurements, but instruments are installed elsewhere in the vicinity. On the east side of Grimsö’s 13,000 ha is a moss and mire area of approximately 800 ha. The area has potential for research into issues relating to mires and wetlands. Skogaryd mire is situated in a part of the country with high levels of nitrogen deposition. Instruments have been installed on the Mycklemossen mire at Skogaryd to measure biogeochemical/physiological mire ecosystems in relation to global changes, process modelling, remote sensing, soil atmosphere, stream water chemistry and atmospheric exchanges. These measurements enable determination of the net ecosystem carbon balance (NECB), which is unique in mire ecosystems. Other Mycklemossen facilities include electricity, fibre-optic internet access, duckboards and sensor equipment that complies with ICOS-EU standards. The Svartberget research area includes the Degerö stormyr mire complex, one of the most intensively studied mires in the Northern Hemisphere. On the mire, there are rigs and chambers for gas measurements, groundwater tubes and soil analyses, and the data generated comprises the world’s longest time series of instrumental measurements of total carbon and greenhouse gas balance from a mire. Within the mire complex, various plant communities grow that represent nutrient-poor conditions, dominated by Sphagnum and Carex species. The peat is mostly 3-4 metres deep, with a maximum depth of 7.8 metres. Groundwater tubes and gas samplers are also placed in the mineral soil in the forest upstream from the mire. 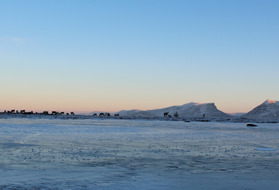 The instruments at Degerö Stormyr have been used to increase understanding of how the carbon cycle in the mires in the Northern Hemisphere affect the atmosphere, and thereby the climate, in both short and long terms. Since 1995, research has investigated how deposition of sulphur and phosphorus, combined with increasing temperature, affect methane emissions from mires. Since 2001, the carbon dioxide flux between the mire and the atmosphere has been continually measured, and since 2004 the annual emission of methane to the atmosphere and export of carbon by run-off from the mire have also been measured. Research at Svartberget also includes the Kallkällsmyren mire with 12 grouped groundwater tubes at varying depths (0.25-4 m) and rigs and chambers that measure gas exchange with the atmosphere. Kallkällsmyren mire is one of the drainage areas within the Krycklan stream network.